Leonidas Polk was a Confederate general in the American Civil War who was once a planter in Maury County, Tennessee, and a second cousin of President James K. Polk. 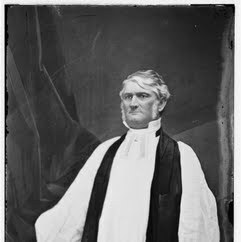 He also served as bishop of the Episcopal Diocese of Louisiana and was for that reason known as Sewanee's Fighting Bishop. He is often erroneously named "Leonidas K. Polk." He had no middle name and never signed any documents as such. The errant "K" was derived from his listing in the post-bellum New Orleans press as "Polk, Leon." for killed in action. Polk was one of the more successful, yet controversial political generals of the war. Recognizing his indispensable familiarity with the Mississippi Valley, Confederate President Jefferson Davis commissioned his elevation to a high military position regardless of his lacking prior combat experience. He fought as a corps commander in many of the major battles of the Western Theater, but is remembered more for his bitter disagreements with his immediate superior, Gen. Braxton Bragg of the Army of Tennessee, than for his success in combat. While serving under the command of Gen. Joseph E. Johnston, he was killed in action in 1864 during the Atlanta Campaign.